We work closely with all families who qualify for financial aid to develop an individual affordability plan tailored to their financial circumstances. We are one of only five need-blind, full-need colleges in the U.S.⁠01 <a href="/glossary#term-need-blind-admissions">Need blind</a> means that we don’t consider your ability to pay for college in the admissions process; <a href="/glossary#term-full-need">full need</a> means we are committed to meeting 100% of demonstrated financial need with our aid. Six out of every 10 students receive MIT need-based aid. The average cost for tuition, fees, books, supplies, housing, meals, and other expenses is about $22,500—that’s approximately what it costs to attend a state school. 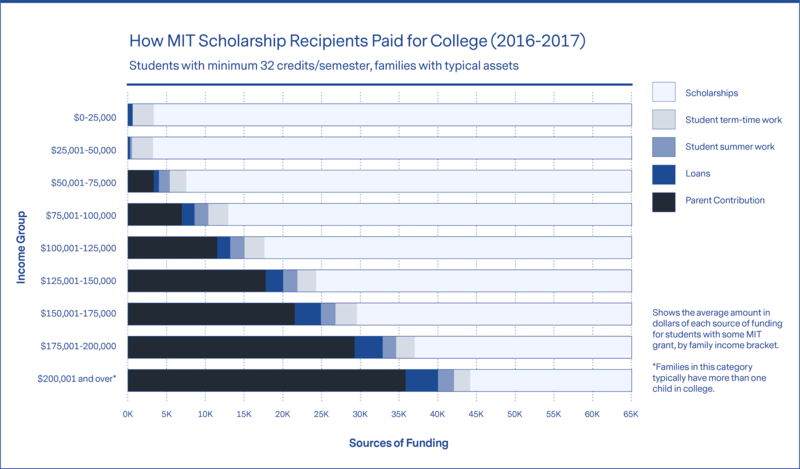 And for students with family incomes under $90,000 a year, we ensure that scholarship funding will allow them to attend MIT tuition free. We expect to award $129.9 million in MIT need-based scholarships in 2018–19, compared to the $97.1 million we awarded in 2015–2016. In 2016–17, 57% of full-time undergraduates received an MIT Scholarship. Among those, the average family contribution after student term-time work and loans was $14,491. In the 2016–17 academic year, 35% of undergraduates received scholarships and grants equal to or greater than tuition. 26% of undergraduates had family incomes under $90,000 and attended tuition free. Their remaining expenses were covered by their family or by the students themselves, through paid work or student loans. For families in this income range, reliance on student loans averaged $697 per student. We do not expect any undergraduate to take out a loan. But we do require students, as the direct beneficiaries of their education, to pay for some part of it. Rather than borrow, most students opt to work during the academic year. At MIT, this work often provides students not only with a way to help pay for college, but also with world-class research experience. Through the Undergraduate Research Opportunities Program, 91% of MIT undergraduates work on paid research projects before they graduate. At MIT, seven in 10 undergraduate students graduated debt-free. Nationally, in 2017, only four in 10 were able to graduate without debt. When MIT students do take out loans, their debt at graduation is considerably lower than the national average. At MIT, only 28% of the class took out loans in 2016–17. They graduated with an average debt of $19,819—31% less than the national average. Nationally, graduates of four-year colleges who borrowed, owed an average of $28,699 in loans.